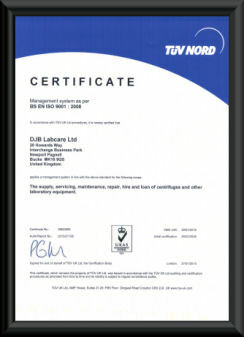 DJB Labcare Ltd achieved ISO 9001 accreditation on 25th February 2009. After years of providing consistently high levels of service, it was the next logical step for the business to aim for full accreditation from an independent and internationally recognised standard. 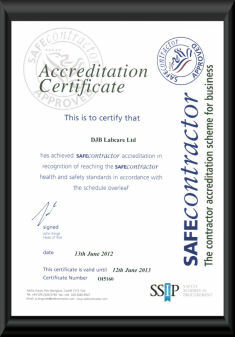 Achieving accreditation has formalised a quality management system that has served the company well in its growth and expansion since its formation in 1993.Accreditation to the SAFEcontractor scheme recognises very high standards of health and safety practices and demonstrates DJB Labcare's commitment to a uniform health and safety policy across our business. In 2016 DJB Labcare achieved ISO 17025 accreditation as awarded by UKAS for our calibration services, each part of our accredited calibration process is proven to be suitable to provide accurate and reliable results. For further information on ISO 9001:2008 accreditation and certification visit www.getiso.co.uk.